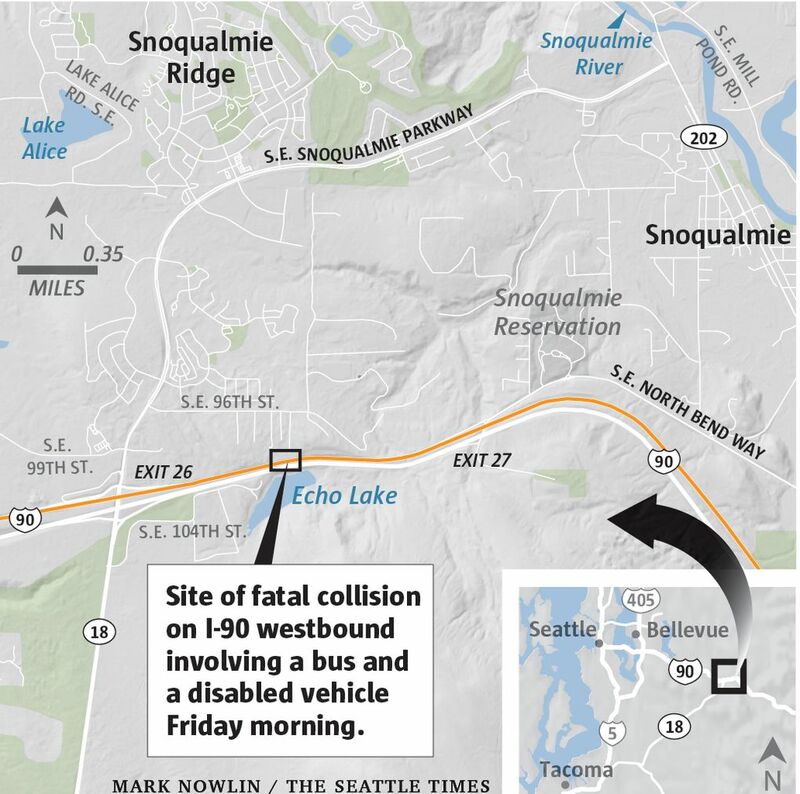 A man died when a bus collided with his disabled vehicle on westbound Interstate 90, just east of Highway 18 near North Bend, early Friday, according to the Washington State Patrol. Patrol spokesman Trooper Rick Johnson said police were notified that a disabled Subaru Legacy was blocking traffic on the freeway at 5:40 a.m. Two minutes later, police learned a collision had occurred at the same site, he said. Johnson said investigators have not determined what happened. “Right now, we don’t know why the Legacy was disabled, whether it was completely disabled or was going slow, and why the driver of the bus couldn’t avoid it,” Johnson said. The Subaru driver was pronounced dead at the scene, he said. A female passenger was taken to the hospital with non-life-threatening injuries, Johnson said. The bus driver, who was the only person on the bus, was not injured, Johnson said. Although some reports indicated that the bus involved was a King County Metro bus, Johnson said that was incorrect. The articulated bus was being transported from Minnesota to Vancouver, B.C., he said. Two lanes of westbound I-90 are closed and Johnson said it’s not known when it will reopen.